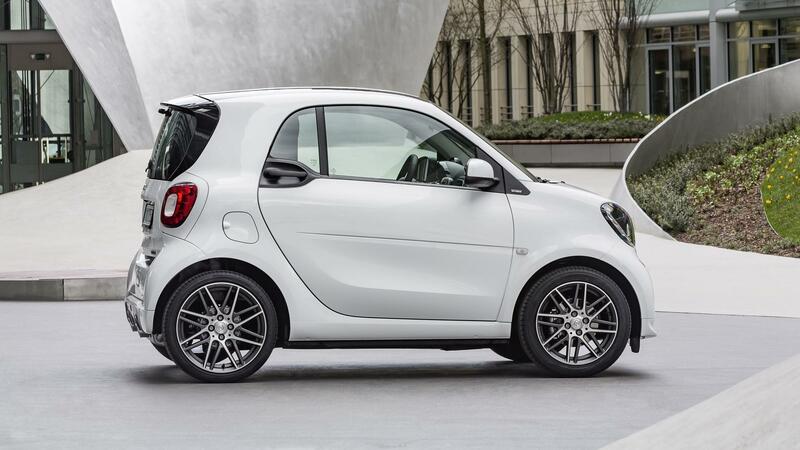 The fastest version of Mercedes’ smallest car – the Smart ForTwo Brabus. I thought fast Mercedes had AMG badges? They do, usually, but for some reason it’s always Brabus – peddlers of 900bhp Maybachs and other, equally outrageous tuned Mercedes – that gets the job of making Smarts more interesting. Fine with us because the result, we suspect, would be much the same. There’s only so much you can do to a car so little. Well, there’s heaps of cosmetic stuff for starters. 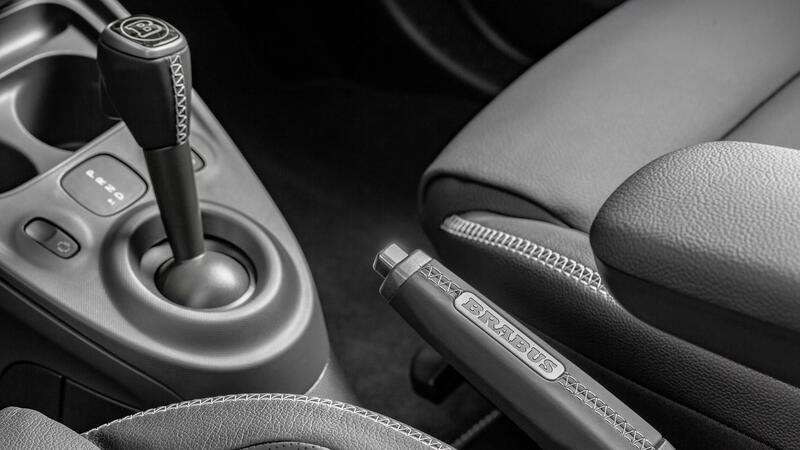 The Brabus alloys, dual single-exit exhaust and bodykit are subtle modifications nicely integrated, and inside you get Brabus-branded gear- and handbrake-levers and, erm, some other stuff that doesn’t stand out quite as much. More of interest to us though are the modifications Brabus has made to the Smart’s relatively humble underpinnings. The engine is the same 898cc three-cylinder turbo you get in the normal ForTwo (and Renault Twingo), only Brabus has upped power and torque by 28bhp and 25lb ft respectively for a total output of 107bhp and 125lb ft.
They’ve also dropped the ride-height by 10mm, added new springs and dampers for a 20 per cent increase in stiffness and given it a thicker front anti-roll bar. 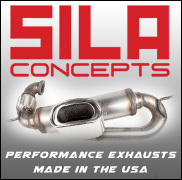 Finally, the EPAS software has been retuned for “increased return torque”, and the overactive ESP slackened-off. 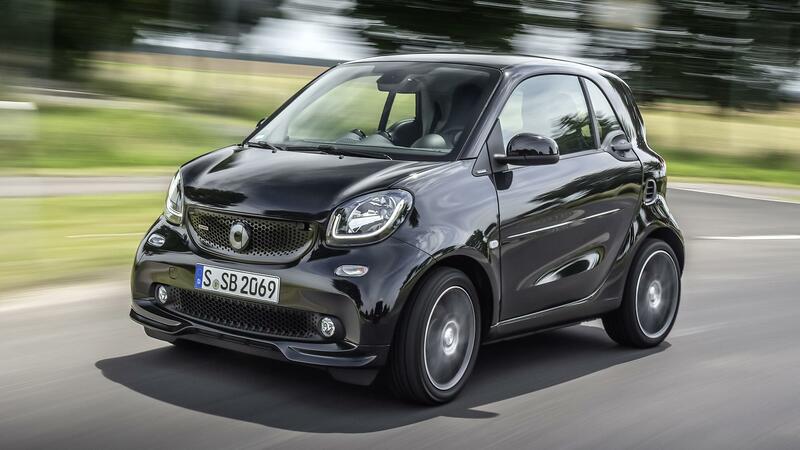 Not a chance – the modifications have hardly turned the ForTwo into a hot hatch. It may be rear-wheel drive, but its behaviour is fundamentally that of a front-wheel drive city car: understeer, understeer and then the inevitable accident. It does feel reasonably pokey, though. 0-62mph in dealt with in less than 10 seconds, and the top-speed is limited to 103mph. We wouldn’t want for much more performance from such a tiny thing. Mixed bag. You can’t get it with a manual, and the six-speed DCT feels clunky and jerky in stop-start traffic, making driving it smoothly trickier than it should be. Stick it in manual and leave it in second. Constantly. Night-and-day different to the old, automated-manual Smarts though. The ride is a bit bobby, it properly thumps over bigger potholes and expansion joints and on faster roads, and the body control doesn’t do your confidence in its cross-country abilities any favours, even though there’s plenty of grip. Despite Brabus’ best efforts the steering is bereft of feel - no surprises there - and the seats gave me backache. Hold fire. My commute consists of stop-start town stuff and then motorway. It’s basically a traffic jam with no potential for nipping, then a steady cruise up and out of the city. The ForTwo is not designed for that kind of thing, which explains why, when I got back into the office the next morning, I didn’t like it very much. However my colleague Ollie Kew, who took it for a blat the next day, tells me threading it through town is a joy. Although if all you’re doing is town-driving, why you’d need the extra power and dynamic polish is beyond me. A regular Smart would surely do. The ForTwo Brabus is for a very specific kind of person. A person who has £16,320 to spend on a tiny car, and who doesn’t need a boot or to carry more than one passenger. Someone who wants the extra power and style of the Brabus, and is prepared to pay for it, even though they never leave town, and can get literally anywhere more quickly by Tube. Or foot. The Brabus ForTwo is not a bad car, but sensible money buys something that works everywhere, not just city-centres. Like a VW Up. The fast one, obviously.